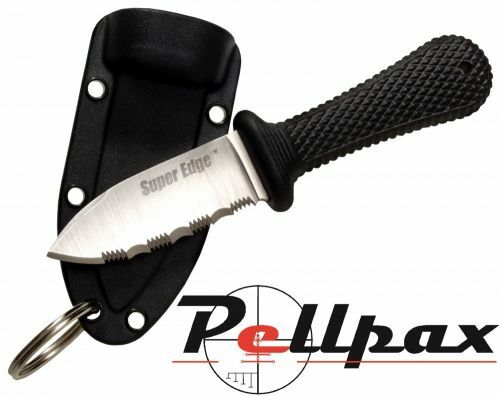 The Super edge is everything you could want from a sheath knife but in a very compact package. With an overall length of 4" and weighing only 0.8oz this small yet powerful blade will come with you anywhere. The 2" blade crafted from 8A stainless steel is great for cutting, slicing and dicing the toughest materials that other bigger knifes couldn't handle. The super edge has a serrated cutting edge allowing it to saw though certain materials with ease. 8A steel is known for it's versatility, strength and overall reliability. With a thickness of 2mm to reinforce the blade during though jobs this is a very handy little tool. The 2 5/16" handle is crafted from a very trust-worthy material known as Kray-Ex. This material is known for providing excellent grip to the user whilst also being very comfortable to hold even during use! Completed with a Secure-Ex neck sheath the Super edge is a great, handy tool to own. Add this item to your basket & spend an extra £472.01 to apply for finance.